Sunday night's hour-long debate was unrelentingly harsh and fact free and dwelled on issues unrelated to the job of governing Florida. But there were plenty of zingers. 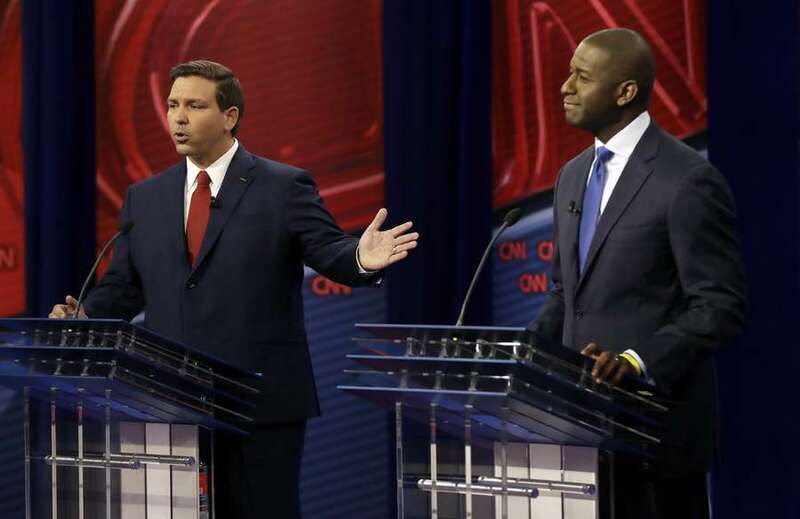 Republican Ron DeSantis and Democrat Andrew Gillum had never met before Sunday night's Florida governor debate. It was not the beginning of a beautiful friendship. Rather, it was a nationally televised brawl between the two candidates neck-and-neck in one of the nation's most closely watched state races. They unleashed a torrent of attacks and accusations aimed at the other's credentials, policy positions and those who associate with them. DeSantis had barely finished thanking his wife, Casey, in his opening remarks before he called Gillum a "failed mayor" of Tallahassee who wants to raise taxes. "That was a mouthful," a surprised Gillum said. Gillum then painted DeSantis as an obstructionist former Congressman that worships "at the feet of (President) Donald Trump." From the beginning of the hour-long debate, it was clear there is little common ground between these two men, each of whom rose from obscurity and the activist wings of their respective parties to become unlikely gubernatorial nominees. Asked about climate change, in light of Hurricane Michael's powerful pass through the Panhandle, DeSantis said he would work with South Florida on resiliency against sea water rises. He added: "I don't want to be an alarmist," before claiming Gillum would bring California-style energy policies to Florida. Responded Gillum: "I'm not sure what is so California about believing that the state of Florida ought to lead in solar energy." On healthcare, neither candidate appeared willing to stand by previous positions. DeSantis claimed support for measures that ensure insurance companies covered people with pre-existing conditions, even as he has repeatedly voted to dismantle the Affordable Care Act, the federal health care law that guarantees just that. Florida is one of several states suing to overturn that provision. Meanwhile, DeSantis repeatedly asked Gillum whether he still supported Medicare for all, a proposal that would guarantee taxpayer funded health care coverage for all Americans. Gillum didn't say, and instead reaffirmed his support for expanding Medicaid, a federal and state low-income health care program that Republicans in Tallahassee have repeatedly limited in scope. "Would you sign the bill for single-payer health care?" DeSantis asked. "What I support is expanding Medicaid for over 800,000 Floridians," Gillum said. It wasn't the only time DeSantis directly challenged Gillum. DeSantis turned to Gillum and asked who paid for the Democrat to see the Broadway musical Hamilton. It was a reference to a trip Gillum made to New York, where he met two undercover FBI agents were investigating corruption in Tallahassee. That sparked one of the tensest moments of the debate. Gillum, the first African American gubernatorial nominee from either major party, said, "I don't take free trips from anybody. I'm a hard-working person. I know that may not fit your description of what you think people like me do, but I've worked hard for everything that I've gotten in my life." CNN moderator Jake Tapper immediately after asked DeSantis why he didn't return a campaign donation from a donor caught using the n-word and why on his first full day as the GOP nominee he said Floridians shouldn't "monkey this up" by electing Gillum. On the donor, DeSantis said, "He made a mistake, he apologized." He then pointed to his record in the U.S. Navy as evidence he isn't prejudiced. "Here's the deal, when we're down range in Iraq, it didn't matter your race," DeSantis said. While Gillum often skirted DeSantis' questions, DeSantis didn't always answer Tapper. Asked if he thought Trump was a good role model, DeSantis pivoted to his support for moving the U.S. embassy in Israel to Jerusalem, a topic that came up an inordinate amount despite its questionable relevance in a state race. However, it was a reflection of one of the underlying questions facing voters this November: Who is best suited to lead the state in the era of Trump — someone who will stand up to the administration or someone who is a close ally of the president? Perhaps more than any other race in the country, the election between Gillum and DeSantis is seen as a proxy for the national debate between resistance-minded progressives and Trump. Polls have consistently shown the race effectively tied or with Gillum slightly ahead, not surprising in a purple state with a recent history of especially close gubernatorial elections. However, a CNN poll released just hours before the debate gave Gillum a 12-point advantage over DeSantis among likely voters, a huge margin that if true means the so-called "blue wave" expected to sweep Democrats into office could be on the horizon. In a Trump-like move, DeSantis' campaign responded by going after CNN, all but accusing the cable news network of a conspiracy to undermine the Republican just before a critical moment in the race. Gillum said he proved he could work with political adversaries during Hurricane Michael, when he and Republican Gov. Rick Scott ensured the safety of Tallahassee residents during and after the storm. "He and I don't agree on much on public policy but when it comes to dealing with a natural disaster we put the mess aside and get the job done," Gillum said. In his closing remarks, DeSantis argued he would carry the mantle from the state's economic recovery under Scott. "We've got to keep our economy going, people are getting opportunities," DeSantis said. "We can't destroy it with stiff tax increases that are gonna cost jobs and prevent more businesses from coming into our state." Gillum, meanwhile, concluded with a case for diverging from the national politics of the moment. "In Trump's America we've been led to believe that we've got to step on our neighbor's shoulder and their face and their backs in order to get ahead," he said. "Well I reject that."